The wide range of services and veterinarians allow the UF Large Animal Hospital to offer superior care to all large animals; not just horses. 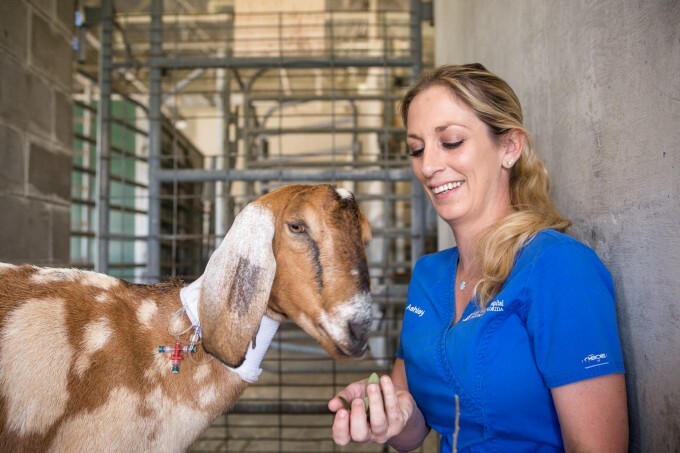 The UF veterinarians treat goats, alpacas, llamas, pigs, cattle, and other farm animals from the Gainesville, Ocala, Jacksonville and surrounding Florida areas. Our large animal patients receive the same emergency, neonatal care, surgical services, internal medicine, reproduction, and ophthalmology services that our equine patients receive. If you have questions or want information about a service that isn’t listed, please call the hospital at 352-392-2229 or visit our contact page. The UF Large Animal Hospital veterinarians treat equine and large animal patients from the Gainesville, Ocala and Jacksonville areas, including Alachua and Marion Counties in Florida, and our clients come from all over the United States. Contact us to speak to one of our specialists or to make an appointment.